These days, rocket cycle enthusiasts have broadened their horizons to experiment with many different types of jet engines. 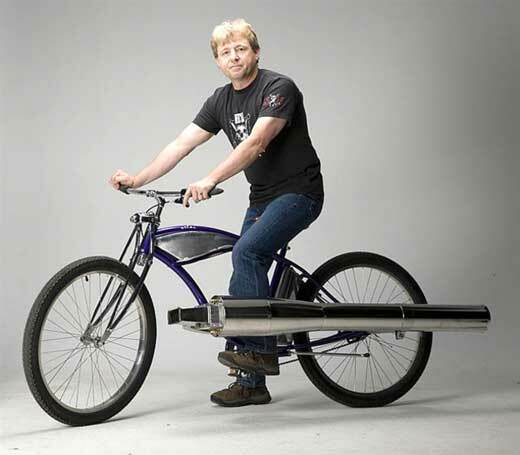 Relatively speaking, today's jet-powered bikes are safer, more affordable, more fuel-efficient and generate less heat than yesterday's rocket engines. Yeah, I know that's not saying much since those rockets were dangerous, expensive, gas-guzzling firebombs. Don't worry, we'll show off updated models of those as well. 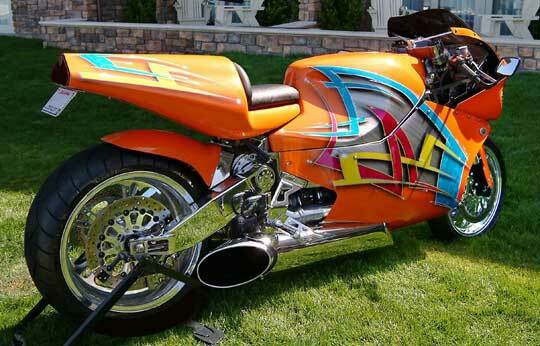 Some of the fastest motorcycles on the planet, Dragbikes burn pure rocket fuel to produce some incredible results. Nitromethane, or "Top Fuel" is the propellant of choice for these 1300hp monsters. 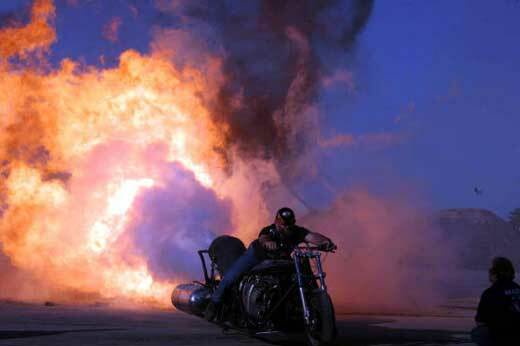 Eric Teboul broke the Dragbike World Record in 2009, covering a quarter mile in 5.27 seconds. That's 251 mph if you don't feel like doing the math. See Eric's record-breaking run below. Larry McBride, pictured below, is another top racer and former World Record holder. And he's got a sense of humor about it, too, donning a spiderman suit all the while. Might that just be an homage to The Human Fly, mentioned in Part I? Nah, probably not. That's Spanish for "This Thing Gets Hot!" Juan Manuel Lozano Gallegos has lived, breathed and dreamed rockets since his teens. He built a jet-powered go-cart in 1974 at the age of 19 but went back to rockets when he found the jets to be lacking in power. That's my kind of guy! To call Juan a Do-It-Yourself'er is a bit of an understatement. He's happy to show you exactly how he produces his rocket gear, but don't get any ideas of copying his technique — his end-results are awe-inspiring. 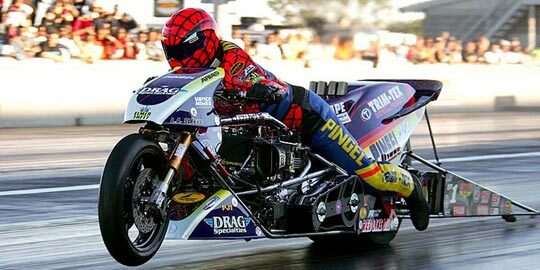 In addition to providing the technology behind Eric Teboul's World Record-holding Dragbike, Juan also built the world's fastest bicycle. Naturally, it was rocket-powered. These days, Juan will put a rocket in just about anything but his top-priority is building a commercially-viable jetpack. Can't say I blame him. 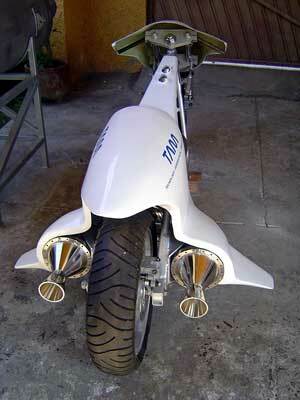 Leading the charge in the all-important Smoke & Fire Division, we have the Mad V8 Jet Bike. Boasting a 3,800 hp jet engine, this baby can light up the night sky. Last time I checked, it had never actually been ridden anywhere, so I guess we'll have to wait on the speed specs. Australian owner Ron Laycock knows he's got a good thing going, and he's not afraid to share. Ron's also got a healthy respect for the traditions of his sport, here showing off his ride in the name of some good ol' fashioned T&A. Won't somebody please get that poor girl a jacket? 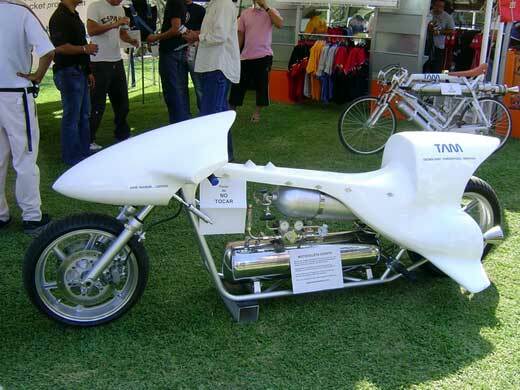 Proving just how mainstream these types of reaction engines have become, MTT has made a jet engine-powered, production model bike called the Y2K Turbine Superbike for about a decade. 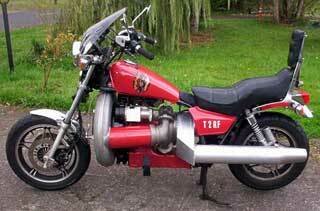 Theirs was the first street-legal, turbine-driven bike and its 320hp engine topped out at about 225 mph. At the time, Guinness called it the most powerful production motorcycle ever made. Unfortunately, they also called it the most expensive production motorcycle ever made. Below is the Streetfigher, a more current model from MTT, which can be yours for a mere $175k. Somewhere in Germany, Fritz von Opel is rolling over in his grave. So who would buy one of these puppies? Jay Leno is a self-proclaimed member of the "More Money Than Brains Club", so it's no surprise you can see him testing one out below. So what is an aspiring jet-biker to do if he's got more time than money? That's easy... study the DIY'ers. They build their own jet engines from scratch and then document it all meticulously so that others can join in the fun. A bunch of them hang out at the DIYTurbines Yahoo Group, so that's a great place to start. Pictured at right is a late model Honda Magna modded to fit a Boeing T-50 jet engine. It recently sold on eBay for less than ten grand. The video below is of a home-built gas turbine engine from Australian DIY master John Wallis. Does it Come With a Kick Stand and a Basket? Bob's gotten quite good at attaching pulse jet engines to two-wheelers and then polishing 'em up to look like production models. He even sells his engines to hobbyists, so you can get a quick start on your new obsession. Bob reckons one of these will take your bike up to 75 mph, but he's been too chicken to open it up all the way. OK, I was kidding about the "chicken" comment. In fact, Bob once had the crazy idea to strap one of those pulse-jet engines to himself! Yes, you read that correctly, and there's a picture below to prove it. These days, though, Bob is working on a pulse-jet motorcycle (yes, please) and a TV show documenting his exploits.